At Blyton Dental, we are delighted to inform you of a convenient new referral service for regional practices. Blyton's new Cone beam CT scan allows your patient's bone structure and tooth orientation to be scanned in just 20 seconds. The technology adds a whole new dimension to digital diagnostic dentistry. The benefits of CBCT scanning are becoming more and more apparent and there is a place for these scans within many areas of dentistry. One scan with our new machine gives you not just a CT image, but also an auto Panoramic image. This means patients who require both images do not need to undergo two X-ray scans. Software to view and manipulate both 3D images is also available. 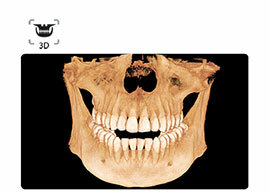 A CBCT that doesn’t get affected by metal artifacts and while still producing high 3D image quality.